As official timekeeper and sponsor of the Grand Prix de Monaco Historique, Chopard present this sleek inspired chronograph timepiece. Boasting a stainless steel case, a pure white dial features a grey, navy and orange colour scheme, with three sub-dials and a date display. 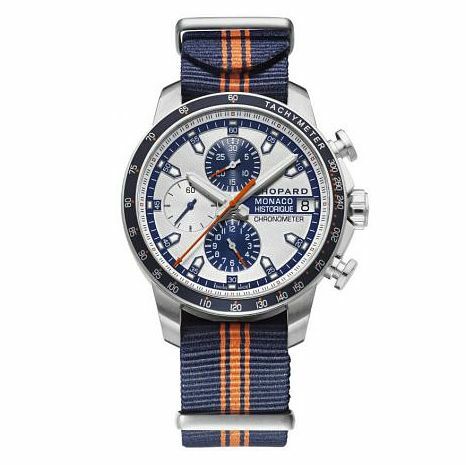 The orange seconds hand co-ordinates with the orange striped detailing upon the strap, with the navy tachymeter also bringing the strap and timepiece together.